Hangzhou (China) Sep 15 (IANS) Thousands of technology geeks from across China Hong Kong Macau and Taiwan have been thronging global e-tailer Alibaba s Taobao Maker Fest in China s ancient city of Hangzhou about 180km southwest of Shanghai. Taobao meaning "search for treasure" in Mandarin is Alibaba Group s digital portal opened in 2003 for consumers to buy and sell a variety of goods ranging from electronics home appliances furniture clothing etc. 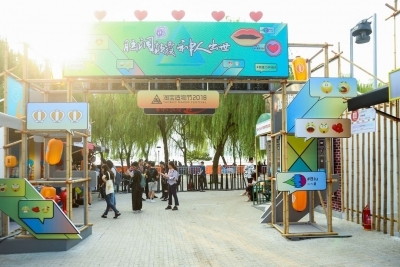 The third edition of the digital platform s Maker Fest is underway by the iconic West Lake in the provincial capital of Zhejiang -- where $40-billion Alibaba is headquartered -- from September 13 to 16. It has over 200 Taobao merchants displaying their innovative technologies and products. "The fest has been receiving global attention from thousands of consumers visiting the four-day fest from countries including China Hong Kong Macau and Taiwan to witness the innovations of Chinese entrepreneurs " Alibaba Group s Chief Marketing Officer Chris Tung told global media representatives while flagging off the fest. The products being showcased by young entrepreneurs from across China Hong Kong Macau and Taiwan and other regions include Internet of Things (IoT) devices for agriculture and businesses giant robots for surveillance virtual reality shopping experiences inventive takes on traditional Chinese clothing calligraphy anime-inspired products and a vintage market. At the first glance the notebooks on planets in the solar system displayed by the firm Astro Reality seem usual but soon as its mobile application scans a particular planet the planet comes alive allowing one to view its surface using the data from the American space agency NASA. From reviving ancient Chinese calligraphy and prints through fashion thereby blending in the tradition with contemporary products to using technology for better shopping experiences like augmented reality-powered goggles to view a mall without being inside it physically -- the fest has been taking the visitors on a ride to the future of technology. With a large number of Chinese youth aged 19 to 38 turning entrepreneurs the world is witnessing technologies and products not only "Made in China" but "created in China" said Tung who was also the brain behind the founding of the festival. The technological innovations being made in the country will have an influence not on China alone but the world at large an Alibaba spokesperson told IANS earlier. "The festival celebrates entrepreneurship and innovations allowing us an opportunity to interact with hundreds of buyers and share with them the stories behind our innovations which is not always possible through digital mediums " Marketing Director of a Chinese IoT firm Ruff Chain Susan told IANS at the fest. Paul Huang a 30-year-old tech professional from Hangzhou and a regular at the fest since its inception in 2016 finds the platform a way to learn about the direction in which technology can take his life ahead. "I buy everything I need on a daily basis including my everyday meals online. The fest allows me to understand the newest of technologies that are available in the world and use them for making my life simpler " he said. The 19-year-old Chinese conglomerate Alibaba which was founded in 1999 by Chinese teacher-turned entrepreneur Jack Ma along with 17 other partners (investors) has been holding the fest as an offline technology and product expo offering a forum for hundreds of merchants and consumers to interact with one another. The fest is being held days after company s co-founder and Executive Chairman Ma announced a succession plan earlier this week appointing the Chief Executive Daniel Zhang as the group s next Chairman from September 2019.